Questions? When will CWRU contact you? It’s always a good day to visit us on the campus of Case Western Reserve University, but our open house days are really special. 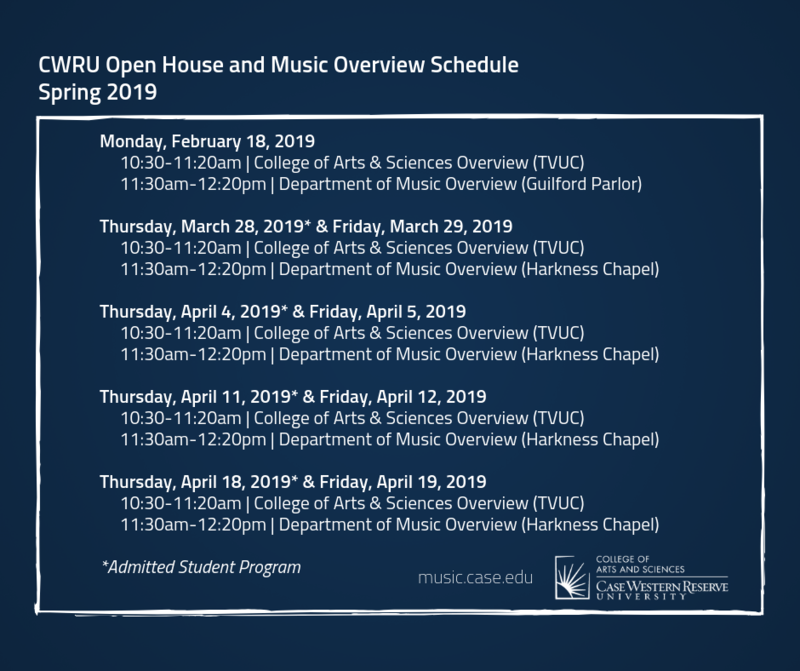 Visit CWRU during an open house and you can meet faculty, tour campus, sit in on classes, grab a meal at our dining halls, explore our study abroad options and learn more about the Department of Music, all in one jam-packed day. Build a schedule to suit your interests. Attend classes, meet with faculty members and current students, explore University Circle and tour campus. Our admitted student programs are designed to expose admitted students to the complete Case Western Reserve University experience. Admitted students interested in scheduling a trial music lesson with a JMP faculty member should email Jennifer (Harmon) Wright. Please allow enough time to coordinate logistics. Please contact the Office of Undergraduate Admission to register! Get the complete CWRU experience! A list of open classes will be provided to students attending the music overview (see dates above). A full list of ensemble rehearsals can be found here. Please find our Upcoming Events at http://music.case.edu/upcoming-events/.